Two of the most important components of the bathroom design are the fixtures and the accessories. While both are necessary for the function and use of the bathroom, they are also important for helping create a cohesive style or look as well. Select the right fixtures and accessories for your bathroom to unite form and function. What Are Bathroom Fixtures and Accessories? "Bathroom fixtures" is the common usage term for bathroom faucets. This includes the sink tap, as well as the shower valve and bathtub filler. Most bathroom accessories are sold as a "suite," meaning that they all match one another in escutcheon, end trim and finish. Faucets are sometimes included as part of this suite; in fact, many faucet manufacturers make matching bathroom accessories for their faucet lines. The result is a bathroom design that is carried through to all areas of the room, giving it a cohesive look. There are countless styles of bathroom fixtures and accessories out there, which means that no matter whether your bathroom design is traditional or contemporary, you will be able to find faucets and accessories that match. 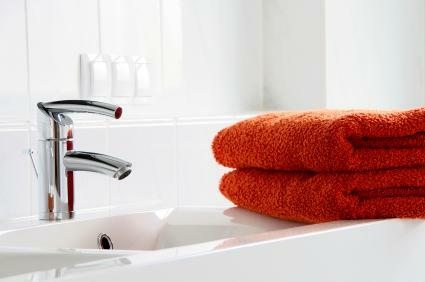 To make sure that your bathroom is as functional as it is stylish, consider these factors when making your decisions. Single lever faucets: Single lever faucets have just one hole in the counter and take up little space. They may have a handle on top or to one side of the stem and are ideal for small baths and vessel sinks. 4-inch spreads: A 4-inch spread is a small faucet that includes the two handles and the spout all on one escutcheon. They can be difficult to clean, because the handles are so tight to the spout, but they take up less room on small sinks and counters. 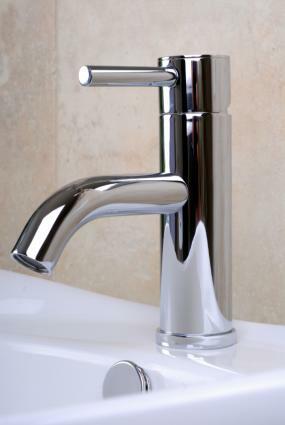 Mini-spreads: A mini-spread is a 4-inch wide faucet that has separate components, rather than a base escutcheon. They can be difficult to find, but they are much easier to clean and maintain in small areas than traditional 4-inch spread faucets. 8-inch spreads: An 8-inch spread faucet is a wide-spread faucet consisting of three pieces installed roughly 8-inches across. They are the most common and the easiest to clean faucet, with plenty of room to navigate around. Porcelain caps: Traditional faucets may include porcelain caps on the handles. They may say, "Hot" and "Cold" or other phrases or be blank. 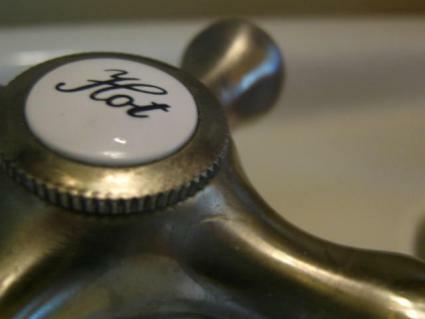 Porcelain caps can be found on all sizes and types of faucets. Porcelain levers: Another traditional faucet design is the porcelain lever. This faucet is metal everywhere except the handle, which is white or black porcelain. Cross handles: Cross-handled faucets can be traditional, with spokes and a porcelain cap, or they can be contemporary with sleek X style handles. They are striking, but can be difficult for children, the elderly or those with messy hands to turn on and off easily. They work best in guest and seldom used bathrooms. Lever handles: Lever handle faucets turn off and on simply, because you don't need to grip the handle. They can be contemporary or traditional in style with many shapes and sizes of lever. Bridge: Bridge faucets arch over an 8-inch spread, but plug the center hole with a metal disc. They are normally traditional in style and can be used on old fashioned sinks or with vessel sinks. Faucets and accessories can be used to cement the rest of the bathroom design into place. Try using any of these styles in your bathroom. For a rustic feel in your bathroom, choose weathered copper or oil-rubbed bronze fixtures with a pitted finish. Go either very contemporary or very traditional in design, depending on the rest of the bathroom's design. JHE's offers bathroom faucets and sinks ideal for rustic styles such as log cabin and westen. If your house is Victorian in style, you'll want to continue that look into the bathroom. To get the look, use chrome, polished nickel or brass fixtures and accessories. Porcelain caps or porcelain handles and escutcheons will help finish the design. Bellacor offers faucets, towel rods, robe hooks, wall-mounted tumblers and more in Victorian styles. If you're going for a modern feel, use either sleek, polished chrome or dull matte chrome in minimalist faucets and accessories. Look for straight escutcheons without decoration and straight, small handles and end caps. ModernBathroom.com sells an assortment of faucets and accessories in sleek styles. Some models are also eco-friendly. 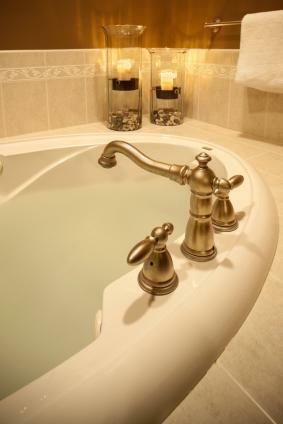 Contribute to the soothing feel of a spa bath with waterfall style faucets in a color that blends in with the rest of the colors in the room, such as bronze, oil rubbed bronze or verdigris. Use simple, minimal style accessories to match. Newport Brass: Newport Brass sells a wide range of faucets and all types of accessories and brass fittings for the bathroom in every finish made. Watermark: Watermark sells both contemporary and traditional fixtures and matching accessories, including lights. Kohler: Kohler suites their faucets and accessories with their porcelain fixtures like toilets and sinks for a truly unified look. If you select a faucet that does not have matching accessories, there are still ways you can create a cohesive look in the bathroom. Find one component of the faucet and try to match that. This may be the escutcheon, porcelain cap, type of handle or the finish. By matching this one component and running the accessory everywhere through the bathroom, right down to the water shut off valves at the toilet and pedestal sink, you'll still get the cohesive look you're after. There are also companies that specialize in accessory lines that may match what you have. Ginger Co, for example, sells a full line of bathroom accessories in a wide range of styles. Your bathroom fixtures and accessories will more than likely be the last things you pick for your new bathroom, but they can be one of the most important. Take the time to select good quality products with matching suites of accessories to truly make your design come alive.